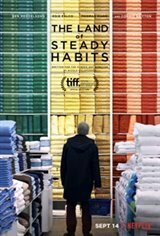 Anders Hill (Ben Mendelsohn), long ensconced in "the land of steady habits" - the affluent hamlets of Connecticut that dot the commuter rail line - is finally ready to reap the rewards of a sensible life. In his mid-fifties and newly retired, his grown son's college tuition paid in full, Anders decides he's had enough of steady habits: he leaves his wife (Edie Falco), buys a condo, and waits for freedom to transform him. Stripped of the comforts of his previous identity, Anders embarks on a clumsy and heartbreaking journey to reconcile his past with his present.